When her former colleagues talk about Virginia Pitts Rembert Liles, the word “gracious” appears frequently in their descriptions of her. “She was gracious and diplomatic,” says Robert Mellown, UA professor emeritus of art history. Liles’ former student Professor Marilyn R. Brown (BSC 1972) remembers her teaching as “a combination of awesome erudition and gracious elegance.” UA professor of art history Mindy Nancarrow adds that “Virginia had an old school way about her.” Those qualities have served Virginia Liles well in a career often spent blazing new trails in academia. Liles’ career spans more than 45 years, highlighted by her popularity as a teacher, her scholarly accomplishments and her administrative leadership in the arts. 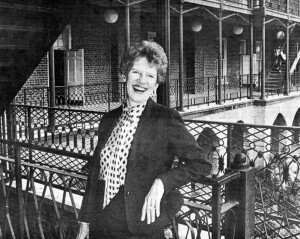 She was the first woman chair of three southern art departments: Birmingham-Southern College, the University of Alabama at Birmingham, and The University of Alabama. In addition, as Donaghey Distinguished Professor of Art and Art History at the University of Arkansas at Little Rock (UALR), Liles established their art history program. She took UAB’s fledgling art program to the department level and later at UA helped to found the joint program for the Master of Arts degree in art history with UAB. Caption/photo credit: In the spring of 1982, new art department chair Dr. Virginia Rembert poses on the porch of Woods Hall. Photo by Lee Ann Lutz (BFA 1980) and courtesy of the UA College of Arts and Sciences. Liles supported her colleagues as well as her students in their research and career paths. Other people’s successes genuinely made her happy. Professor Mindy Nancarrow remembers that while she was working on her first book on the Spanish painter, Bartolomé Estéban Murillo, Liles encouraged her scholarship and helped her connect with other scholars in her field. “She made me feel like I was special.” Liles has always had a strong network of colleagues around the country who were also friends. Artist Dorothy Gillespie, Pace Gallery founder Arne Glimcher, Met Museum librarian Robert Kaufmann and art historian Eleanor Tufts are a few examples. A brief overview of female heads of departments generally, and of academic art and art history departments specifically, shows how groundbreaking Liles’ career has been. In North America, only a sprinkling of women had served as academic department chairs in areas other than art since at least the 1920s. Stand-alone departments of art history broke ground within their institutions by hiring women as heads in the mid-1970s. Anne Coffin Hanson, the first female full professor at Yale, became chair of its Department of the History of Art in 1974, the first female department head at the university. In 1975 Madeline H. Caviness was named the first female department chair at Tufts University, also in art history. In academic departments of art (that often included art history), change was slower, although, oddly, the South may have been an exception. As early as 1960, Professor Gulnar Bosch, who later became a friend of Liles’, was named head of the art department at Florida State University, a post she held until 1977. If Liles’ administrative achievements seem striking for a time when women were just beginning to make headway in leadership roles, they are even more so for a woman who was tragically pushed into her career. She met her first husband, John Lamar Rembert, while working on her master’s degree in Fine Arts and Fine Arts Education at Columbia University. They married, moved to Chapel Hill, NC, and then to Beloit College in Madison, WI, where he served as head of the art department. After her husband suffered a debilitating illness, the world she knew abruptly changed. She took over her husband’s teaching and began to study art history more seriously. The next years she spent caring for her invalid husband (until his death in 1978), teaching at several schools until arriving at Birmingham-Southern in 1960, all the while continuing her education. Liles earned a second master’s degree in art history at the University of Wisconsin, and ultimately her Ph.D. in art history and archeology at Columbia in 1970. In 1970 the ten-year department veteran was named chair of the art department at Birmingham-Southern. In 1973, Frederick W. Conner, the new dean of the School of Humanities at UAB hired Liles away from BSC to turn UAB’s new art program into a full-fledged art department where she stayed for two years before going to Arkansas in 1975. Liles remembers, “They started looking for someone [to head the art department] at Alabama the year before they hired me. I heard about it, but I didn’t apply.” In the second year of the search, they asked her if she would be interested. “[Dean of the College of Arts and Sciences] Doug Jones was wonderful. I was hired for ten months and I could be off for two months in the summer.” With characteristic understatement she recalls some resistance: “I think some of the studio men were a little leery of having an art historian be in charge. So there was some difficulty for the first two or three years – a little rough going until I got my sea legs.” Liles kept the peace at Alabama, however, and even made some friends as she pushed the department to make the changes it needed to stay competitive with comparable schools, and to lay the groundwork for future improvements. Liles made slim educational resources go farther. UA and UAB had small undergraduate programs in art history, and each wanted to create a graduate program. She and John Schnorrenberg, then chair of UAB’s art department, whom she had known since Chapel Hill, worked with art historians on both campuses to create a joint program for the master of arts degree in art history between UA and UAB. They brought in John Howett, who had established Emory University’s art history program. Liles said they wanted to make sure “we were doing it right.” Howett read through the proposal and made suggestions. “He was just wonderful,” she remembers. In 1987 Liles and Schnorrenberg started the only program for the MA in art history in the state. Virginia Liles excels as a scholar as well as a teacher and administrator. She has published articles and numerous reviews for Woman’s Art Journal, Arts Magazine and Art Papers, as well as other scholarly publications. She also has done her part to build the arts community wherever she has lived by lecturing to interest groups, and writing for museum bulletins, popular arts magazines, and newspaper reviews. Since her retirement in 1999, she continues to publish: Mondrian in the U.S.A. (Parkstone Press, 2002); and most recently Bosch (Parkstone Press, 2004). She has two books in progress, one a biography of the artist Carl Holty. In 1993, UA’s College of Arts and Sciences’ Society of the Fine Arts awarded her the Distinguished Career Award. Liles now lives at Danberry Retirement Center with her artist husband Raeford Liles. She continues to write and is currently working on her memoirs. Her recent drawings and paintings will be exhibited at the Unitarian-Universalist Church of Birmingham in February.